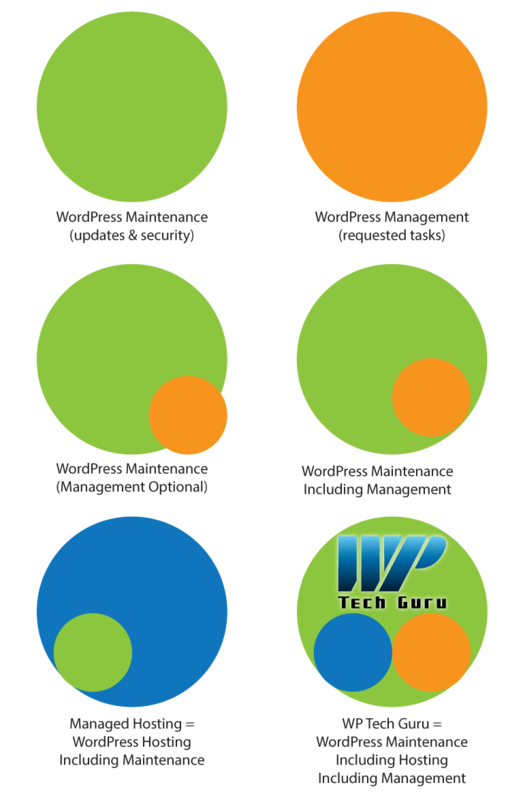 Are you wondering what kind of support would best meet your WordPress website needs: a Maintenance Plan or a Managed Hosting Plan? If so, this article will help you decide. How did figuring out how to support your website get so confusing? Well, in the 1990s a “webmaster” did management, administration and usually hosting too. Back then most sites were developed primarily with HTML code. Later “web designers” began creating websites with WordPress and other tools, this exploded in 2010. These entities did not take on the responsibility of hosting or administration for the site. That fell back onto the client, or business entity. While clients were used to paying for hosting in the past, they were not used to being responsible for the technicalities of maintenance and administration. Essentially, nobody was minding the store. Unfortunately for some this led to many sites being hacked or defaced (millions of WordPress sites in 2017 alone). Others ran into technical problems or crashes. All because websites weren’t being looked after and maintained and in some cases because of bad design decisions. Thus, “Managed Hosting” became popular. This wasn’t exclusive to WordPress but it exploded because it was a way to increase the bottom line for the hosting companies. What was included with Managed Hosting varied wildly across the web. “Managed WordPress Hosting” or “Managed WordPress” was a little bit more consistent and it was offered both directly to the site owners and to designers. Because there are different markets the pricing varies widely from super cheap, generic plans from GoDaddy to $5,000/mo. for large players like webmasters or enterprise solutions. Are there any potential fees I need to be aware of? What if I want some work done? do I got to a virtual assistant? A designer? A developer? What happens if I want to change web hosts? Are there any fees? Wait a Minute. What About WordPress Management? In short management companies add value to their service, which they are outsourcing offshore, by adding maintenance tasks which used to be handled by a webmaster. If a management / maintenance company doesn’t handle your hosting then they will be hampered when there is a problem. WordPress is database driven! If something goes wrong it is ideal to have full access to the hosting including ability to reach server technicians without having to go though the end user. AND who better to talk to the server technician than an experienced webmaster. This is where you save time with WPTechGuru. With our plans, you don’t have to worry about hosting, maintenance or management. You can go back focusing on what you do best. Low-cost Managed WordPress Hosting is targeting end users not professionals. As an end user you are free to make mistakes – if you choose a bloated theme, or a slow social media plugin then you are starting a downward spiral to a slow website. When you hire a experienced professional (who pays attention to Page Speed) you can avoid those and many other problems. Most Managed WordPress Hosting solutions have specific caching settings. Every website is different so an all in one caching solution built into your hosting account doesn’t allow your webmaster to optimize your website even more to get truly blazing fast page speed. Most Managed WordPress hosting products are Maintenance Only and do not provide management services.